Welcome to the second annual THEMIS ART MONTH. From Jan. 31 through March 4 we will be showcasing images for their aesthetic value, rather than their science content. Portions of these images resemble things in our everyday lives, from animals to letters of the alphabet. We hope you enjoy our fanciful look at Mars! With this, we end our second annual art month. So that's where that link from my bicycle chain got to... 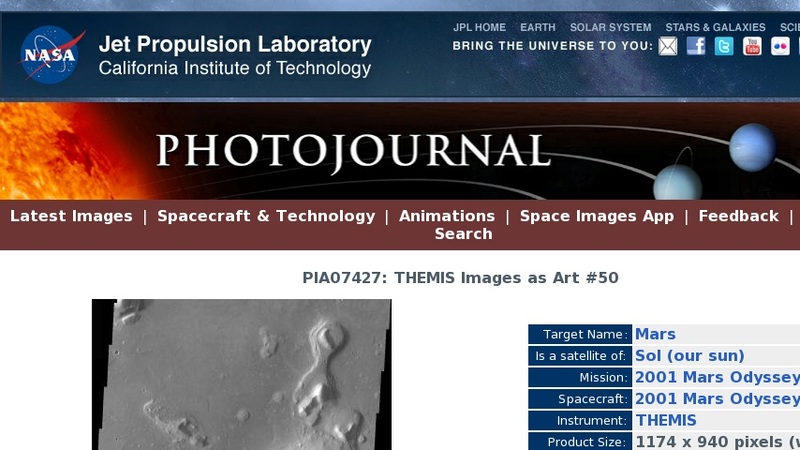 Note: this THEMIS visual image has not been radiometrically nor geometrically calibrated for this preliminary release. An empirical correction has been performed to remove instrumental effects. A linear shift has been applied in the cross-track and down-track direction to approximate spacecraft and planetary motion. Fully calibrated and geometrically projected images will be released through the Planetary Data System in accordance with Project policies at a later time. NASA's Jet Propulsion Laboratory manages the 2001 Mars Odyssey mission for NASA's Office of Space Science, Washington, D.C. The Thermal Emission Imaging System (THEMIS) was developed by Arizona State University, Tempe, in collaboration with Raytheon Santa Barbara Remote Sensing. The THEMIS investigation is led by Dr. Philip Christensen at Arizona State University. Lockheed Martin Astronautics, Denver, is the prime contractor for the Odyssey project, and developed and built the orbiter. Mission operations are conducted jointly from Lockheed Martin and from JPL, a division of the California Institute of Technology in Pasadena.